You are here: Home / Bail Bond Blog / Veterans, School Children and Bail Reform, Oh My! This morning I arrived in the office early. I grabbed a cup of coffee and sat down to read through the long list of emails I had received over the last 8 hours. After deleting all the SEO solicitations, and once in a lifetime deals from Bed, Bath and Beyond, I happened upon one email from a colleague with the title, “PJI Fantasy Calculation.” Having a feeling what this was going to be about, I took a big long sip of coffee and clicked on the link provided in the email. 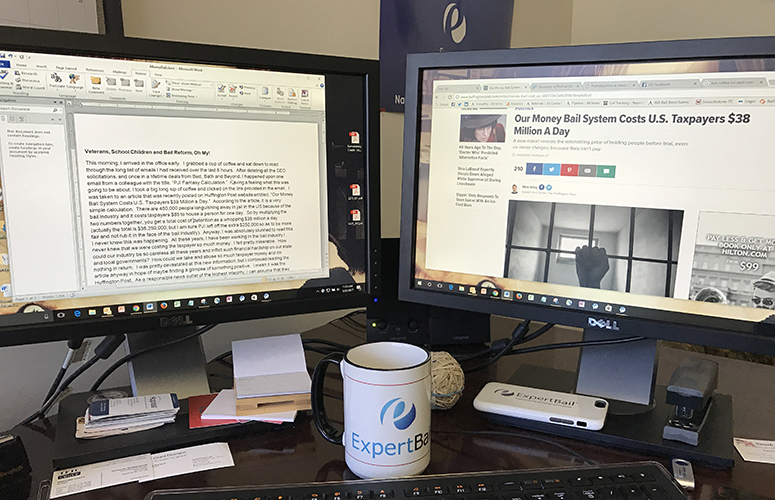 I was taken to an article that was recently posted on Huffington Post website entitled, “Our Money Bail System Costs U.S. Taxpayers $38 Million a Day.” According to the article, it is a very simple calculation. There are 450,000 people languishing away in jail in the US because of the bail industry and it costs taxpayers $85 to house a person for one day. So by multiplying the two numbers together, you get a total cost of detention as a whopping $38 million a day (actually the total is $38,250,000, but I am sure PJI left off the extra $250,000 so as to be more fair and not rub it in the face of the bail industry). I was absolutely stunned to read this. I never knew this was happening. All these years, I have been working in the bail industry I never knew that we were costing the taxpayers so much money. I felt pretty miserable. How could our industry be so careless all these years and inflict such financial hardship on our state and local governments? How could we take and abuse so much taxpayer money and do nothing in return. I was pretty devastated at this new information, but I continued reading the article anyway, in hope of maybe finding a glimpse of something positive. I mean, it was the Huffington Post. As a responsible news outlet of the highest integrity, I can assume that they would be fair and balanced about their stories, even if the topic of that story was such an ideological driven one like criminal justice reform. Either way, I continued down my path of enlightenment in search of facts and truths. The more I read the worse I felt. The bail industry costs taxpayers not just $38 million a day, but $14 billion a year. WOW. And according to the article, that is money that could go towards building homes for 50,000 veterans, buying school lunches for 31 million students or hiring 250,000 new teachers for elementary schools. Holy cow, we could do all those things with that money. That sure sounds great. I like helping veterans…doesn’t everyone else? I like making sure school kids have a lunch…who doesn’t? In fact, I bet you that the Pretrial Justice Institute, the authoring entity of the study (or shall I say essay) loves giving money to veterans and school kids too. I bet you that no one at the Pretrial Justice Institute even makes a salary, because all the government funding and donations they receive probably go right to helping veterans and school kids. I was so curious and impressed that I went to PJI’s website and looked around for the section of the site that talks about how much many they had given to these noble causes over the years. Unfortunately I couldn’t find anything on that topic. I then poked around a little more and found information online that talks about the salaries that PJI employees make, as well as the salaries that public employees that work in pretrial offices make…all of which are paid by taxpayers. Even more, I discovered how much money was spent on the flagship pretrial program in Washington D.C. that PJI and their advocates tout constantly as the utopia of pretrial justice. For purposes of discussion, that total is approximately $65 million a year…and that is $65 million of pure taxpayer dollars. And guess how much of that budget goes to funding veterans and school children? ZERO. All this research got me thinking. Maybe the Huffington Post should do an expose on the cost of a “No Money Bail System” like they have in D.C. I know that PJI tries to dismiss those costs in this latest essay, saying that D.C. has different salary requirements and cost structures, but if you are trying to replicate one system in other places, I am not sure those excuses hold much weight. The costs are the costs if you want to replicate the outcome. So in my book, sorry PJI, your costs are what they are for this calculation and that cost is $65 million. So let’s look at this closely. D.C., the perfect example of pretrial, spends $65 million to manage a pretrial program for a community of 660,000 residents. That is $98.48 per taxpaying resident. If we were to extrapolate that same cost per taxpayer over the entire country, which I assume is what PJI wants, correct, a no money bail system across the country that is funded purely with taxpayer dollars? With a population of roughly 325,000,000 in the United States, that equates to a robust expenditure of over $32 Billion. WOW. $32 Billion. That seems sort of high doesn’t it? It is more than double the cost of what the bail industry supposedly costs the country. In fact, if the government got rid of all public sector pretrial programs and the plans to eliminate money bail, and instead institute a free market money bail system across the country, the government could save roughly $18 billion. Given this new information, I wonder if the Huffington Post would be interested in another essay. Just think of all the homeless veterans that could be housed and all the hungry school children that could be fed. Now anyone out there with a 5th grade math background can see that math being used in these examples is far from valid. For PJI to say that the private sector costs the taxpayer a single dollar is a completely false. Tax dollars are used to build jails and prisons and house inmates for a reason. Those are costs that communities incur to remain safe from the individuals who have tried, or are accused of trying, to harm them. To put that cost on the private commercial bail industry is misleading at best. As a private industry, the commercial bail industry does not rely on government dollars to operate. They rely on the private money and investment of individuals and families looking to run a small business and sell a service that is purchased by the private money of families looking to secure the release of a loved one before trial. At no point in the value chain is a single public taxpayer dollar spent. To write an essay stating that the cost of all the buildings, land, resources, staffing, insurance, etc. that are required to operate our criminal justice system is caused by the commercial bail industry is ludicrous. To then say that veterans go homeless and children go hungry because of commercial bail is a complete and utter fairy tale. It is time to stop the hyperbole and start the common sense discussion about the crime problem we have in this country. It is time to start coming up with the “best” solutions to solve these problems and not play politics and have ideological debates. Our criminal justice system is broken; no one in the bail industry would ever disagree with that fact. But the problem isn’t the use of money in the system; it is much more complex than simply that. Removing money from the system puts the entire system in the hands of the public sector at a cost…and a rather high one at that. Since PJI and the Huffington Post raised the question, I will raise it again…wouldn’t it make more sense for public funds to go towards housing veterans and feeding children than replacing a private system that already works pretty well? Maybe that is the question that needs to be answered.